Have you guys been watching the Olympics? I traveled to Dallas this weekend with some friends, so I did not get to watch a lot, but I caught a little bit of ice skating last night. What is it about the Olympics that is so... inspiring? Every time I watch the crowd cheer for their countrymen, I get all tingly. It's just an honor to be able to represent your country in such a special way. I obviously get so excited when the USA wins, but it is so fun to watch other countries (especially the small ones) have moments of victory as well. I've never really had my own Olympic dreams (underwater basket weaving, anyone?) but every four years I can't help but wish that my parents had discovered that I was a snowskiing prodigy and, after years of training, I'd be out there making my Olympic debut. What is your favorite winter Olympic sport to watch? 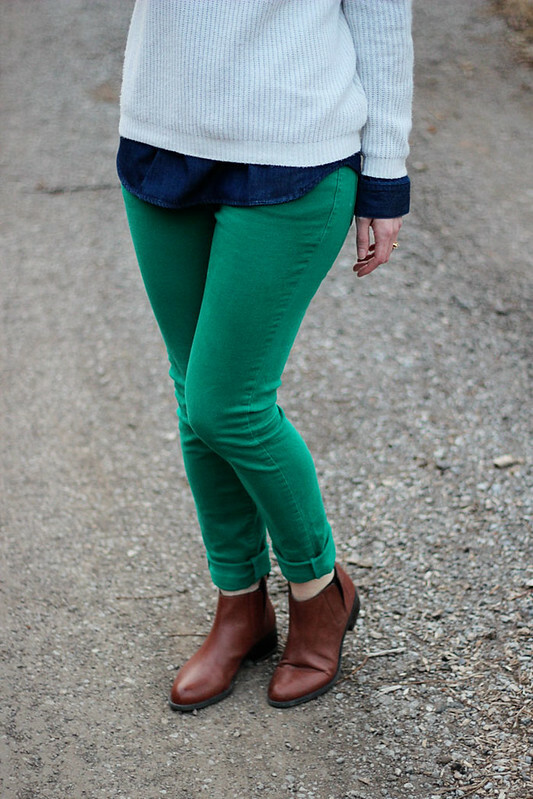 LOVE those green pants and the booties. A great combo. I enjoy watching skating. Visiting from Funday Monday! I just love the skating. I was convinced as a kid that if I skated on our local outdoor rink every day, I could be an Olympian. Too bad I could never do a jump. Love the green and blue together. Such a fresh outfit! 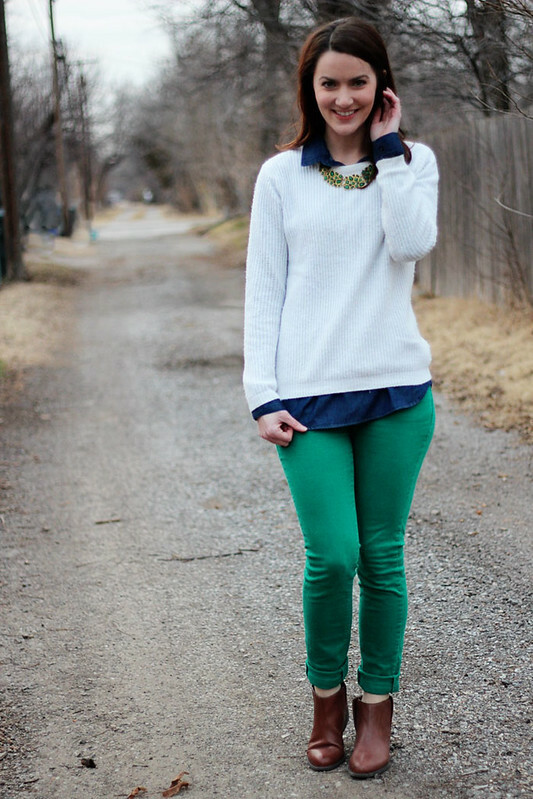 The necklace complements the green pants beautifully! I really like the Olympics but it seems like each time I've had time to sit down and watch there's been almost nothing on! I've always really like ice skating, bobsled, and luge, so I'm hoping to see some of those! Ooh, I love a good chambray/sweater/bib necklace combo. Yours looks great with the booties and fun colored skinnies! I've always admired the figure skaters. Being barely proficient in moving forwards and backwards on the ice, I'm always blown away by how the pros do it! Cute outfit! I'm way behind the times, but I'm finally starting to think I need a chambray top haha. I love watching the figure skating! You're really beginning to make me REALLY like this shade of green! Love this look on you. :-) Sadly, I don't watch the Olympics. In my house, it's all Olympics. All the time. Can't get enough! Love the green pants! You look great!! I love your green pants and that green necklace! Navy blue and kelly green is one of my all time favorite color combinations!! I prefer the summer Olympics but the Luge and the Downhill Skiing are fun to watch. I totally get sucked into curling though I can never understand why. We watched the Olympics all weekend long. I just love seeing all of the different events! 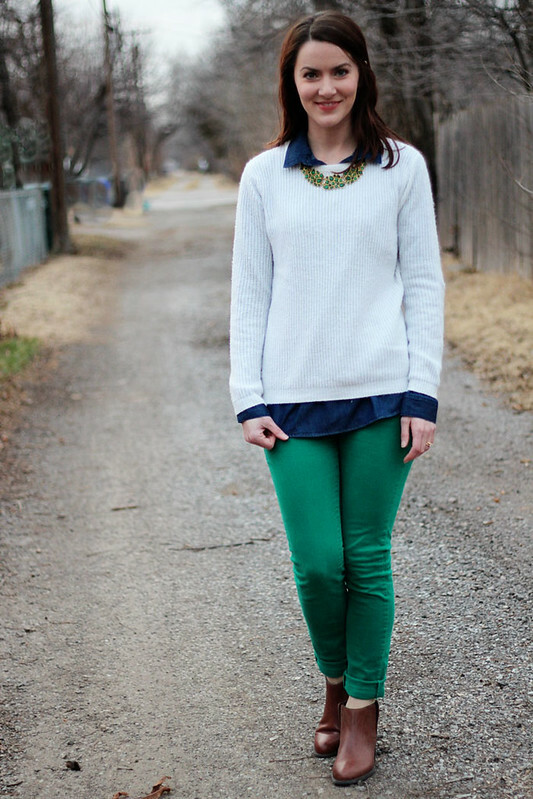 Thanks for linking up with Mix it Monday and sharing this adorable outfit! I just think it is amazing that these people are the best in our whole country! I can't imagine what that feels like! Loving these green pants by the way! Andi at Just Another Smith got some and you've styled your so cute! I think they are officially on my wish list now! Those green pants should get the gold medal. I grew up in Florida, so my dreams of being a figure skater were thwarted by reality. I went ice skating a few times in high school and it was....not Olympic-caliber. I did manage to go backwards! On purpose! I love watching the figure skating, as well as the ski jumping, and luge. Wheeee! 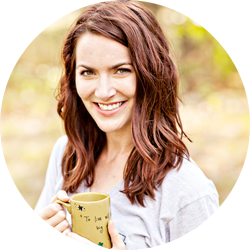 Ashley- thanks for coming by my blog! I have to confess that I am not obsessed with the Olympics...I feel very un-American even saying that! Of course I enjoy watching ice skating and some skiing or whatever but I just can't watch it for hours on end. Really there are few things that I can do for hours. BUT I will say: I watched an awesome ESPN 30x30 about Olympic ice skating that I really enjoyed. It's called "Price of Gold", look for it on Netflix! Great layering here, and I love the pretty necklace! LOL! underwater basket weaving! It is truly inspiring. Those Olympians work so hard and they're reaching their goals. Reaching goals is always inspiring. I haven't watched too much of them this time unfortunately. I love that you're brining in the white again in this outfit. It looks so crisp. Love your outfit! That necklace is super cute! When I was younger I remember watching the Winter Olympics one year... I loved the figure skating and I would twirl and jump around my living room pretending I was in the olympics! Oh to be young again! I like watching the snowboarding. I had been a part of ski club in middle and high school, but always envied the snowboarders. Finally, I gave it a shot, and spent the entire day on my bum. Not fun. Especially not fun realizing that I wasn't destined to be a snowboarder. Oh well. On a separate note, I really like the necklace with this outfit! Love everything about this outfit! Especially the boots! I love how you styled the green pants. They're still a little too daring for me! My favorite winter Olympic sport is the biathlon. It's totally a family thing, and we follow it pretty close. Your outfit is perfection! 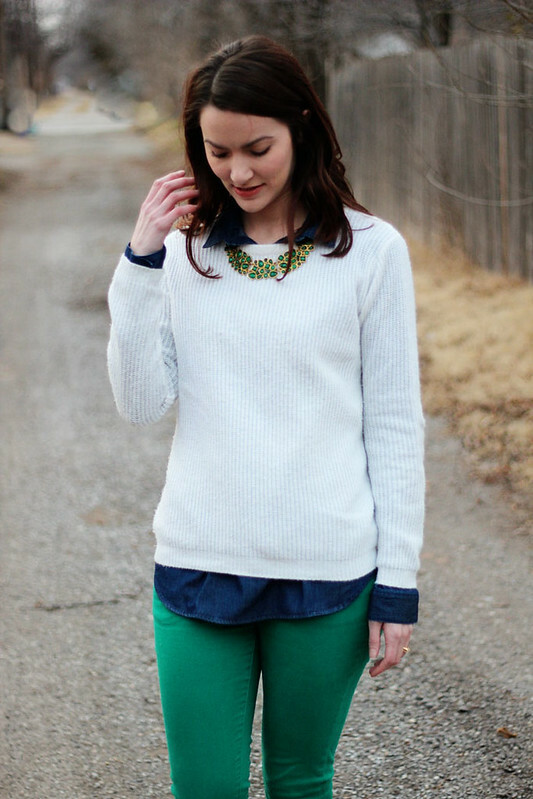 The layering, the necklace complimenting your pants....love it! I'm a huge sucker for the Olympics too. Totally get those goose bumps when I see athletes give it their all! I love the winter white sweater! The necklace looks fantastic with it too. I'm not a huge Olympics fan, but I've seen bits here and there. I just find I get tired of one event too quickly. Love the outfit! And I totally wish I had a secret Olympic talent too haha. It's SO much fun to watch, I can't even imagine how amazing it is to be a part of it! I love the color of your jeans! And I know that I have no athletic skill, but it would be pretty cool to be one of those people! My husband ran cross-country in high school and some of the kids he raced against have gone on to be in the summer Olympics since then! My favorite winter sport to watch is the figure skating. Great outfit! love the blue, green and white color combination. I used to watch olympics religiously with my parents, I dont watch anymore back then I did wish I was athletic lol my favorite used to be figure skating. My favorite is definitely figure skating! Theres something so lovely about watching it.. Seriously, I always wish I had devoted my life to a sport (any sport, really) whenever the Olympics are on. It just looks like so much FUN, and so exciting and so rewarding. I love figure skating, and all of the skiing/snowboarding events, but recently got sucked into the skeleton event (is that what it is called?). Talk about a blast. Figure skating is my favorite, hands down. I love this outfit! Such a cool color for jeans, and they look fantastic with the white sweater and layered chambray.